What more can really be said about GREEN EGGS AND HAM: PARTY EDITION by Dr. Seuss? I think it's a standard go-to book in almost every house I know. My husband and I both agreed that it was one of our favorites books from when we were kids, and I had a great time introducing it to my two! 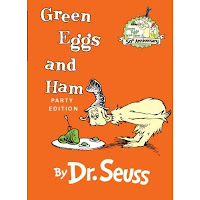 Last night, my son and I sat down to read GREEN EGGS AND HAM together. He is still learning to read and I was very proud of how well he did with this book. The book is ideal for beginning readers because it has some basic words, rhymes and lots of repetition. And then I started to wonder just how many children learned to read by picking up GREEN EGGS AND HAM. The book is celebrating its 50th anniversary so I can only imagine how many hundreds of thousands (millions?) of children have enjoyed this story through the years. In addition to the book, I wanted to share a little something else with you. I found a very fun page on The Other White Meat website which has some recipes inspired by GREEN EGGS AND HAM. You will find recipes for a Ham Sandwich with Greens and Eggs, Ham and Green Egg Mini Tartlets, Ham and Avocado Deviled Eggs, and Ham and Green Egg Sushi. I can't think of a better way to celebrate the 50th anniversary of GREEN EGGS AND HAM. To enter, just fill out the form below December 16th at 11:59 p.m. ET. I will randomly select and notify the winner the following day. This contest is open to those of you with U.S. addresses. Good luck! How can you not love Dr. Seuss? He really is the gold standard on how to write for kids. This is just too much fun to pass up! My husband shares his birthday with Dr. Seuss, so we have fun with that each year. Thanks for the trip down memory lane! I linked you to my Favorite Feeds Friday. We love Dr. Seuss around here and hubby actually made me green eggs and ham one morning for breakfast in bed! We absolutely LOVE Dr. Suess in my home. What a great giveaway! One of great-nieces is the perfect age for this (1st grade).